On Saturday Ali and I went to the Lady Antebellum concert. They were so good! Amazing voices and of course amazing songs. Ali and I had a great time singing along and dancing in our seats. We especially loved Hillary Scott, the lead singer…she was so cute! And totally rocked some sparkly leggings! 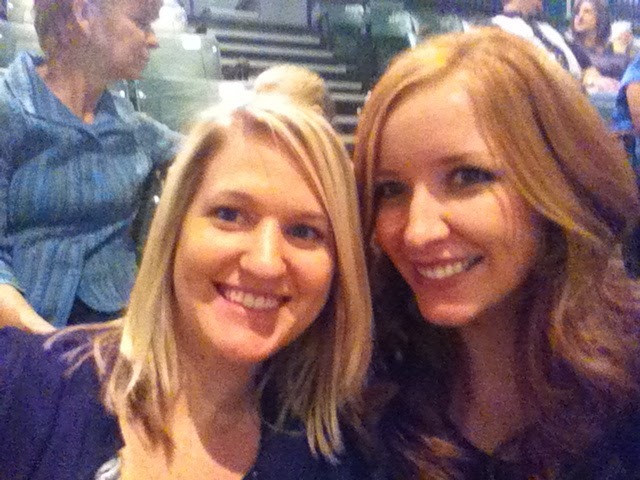 Ali and I at the concert. I forgot to take a picture of my sparkly top…darn! Thanks Ali for a great time! Love Lady A! I'm glad you had a good time……we must get you some sparkly leggings during our shopping day!!! See you tomorrow night! i LOVE them! i'm so glad you girls had fun-and i totally want to see the sparkle top! I love Lady Antebellum. I saw them in May and they were great, too!